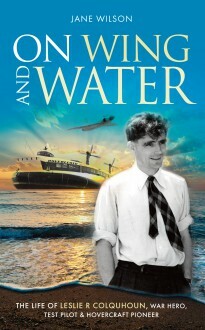 On Wing and Water is the story of Leslie Colquhoun, who was a man who flew high in more ways than one. Enlisting with the RAF at the start of World War 2, he had no sooner got his ‘wings’ than he was plunged into the thick of battle after being effectively kidnapped by a Malta-based squadron to help fight off German attackers during the notorious siege of the island. After the war, having received a Distinguished Flying Medal, Leslie became a test pilot, taking part in attempts to break the air speed record. He then turned his skills to a new invention, the hovercraft, testing early prototypes and taking charge of the world’s first regular passenger service in 1962. During Les’ relatively brief periods on the ground he helped his wife Katie to raise four daughters, one of whom, Jane, has written this affectionate portrait of her ‘modest, gentle’ father, a man who was also exceptionally courageous and skilled.